Then Finn Montgomery, Eliot's long-lost first love, appears, triggering a shocking chain of events that culminates in a split-second decision that will haunt her beloved family forever. How Eliot survives-and what she loses in the process-is a story that will resonate with anyone who has ever loved a child. I Couldn't Love You More will probably make my Top 5 reads of the year. I loved every word. Women’s fiction with grit, heart and soul, I Couldn't Love You More intimately portrays one contemporary family that is pieced together and cemented with love. Humour, heart breaking tragedy and hope grace these pages as Medoff deftly explores family, a mother's love, and an unbreakable sisterly bond. I do not have children, nor do I have any sisters – both of which are at the heart of I Couldn't Love You More, yet somehow this didn’t prevent me from relating and adoring this novel. Captivated from the first few pages, I devoured this story at every possible opportunity and almost missed my subway stop several times. Eliot is not a woman who is floundering when we first encounter her. She’s a mother, stepmother and partner and she loves her life. It isn't always perfect, but she's content, does not crave anything, nor does she have any unfulfilled dreams. So when Finn Montgomery, Eliot's first love, and the one she pinned over for a decade, moves back to town, Eliot becomes confused and her fulfilled life becomes muddled as she reminisces, daydreams and shuffles her feet across the line. Eliot's partner, Grant, is dreamy, kind, an incredible father, and just plain wonderful. Finn is a creepy, self indulgent, tasteless arse. I couldn’t understand what Eliot was thinking with her reminiscing. I couldn’t fathom what was happening and as soon as I was close to writing Eliot off, being utterly unable to comprehend her behaviour, this novel takes a breathtaking twist. I don't always read the synopsis of a novel or by the time one has sat in my To Be Read pile, I've forgotten it and I actually really like to be surprised. The unpredictability as well as the predicament shook me to the core. Honestly - it was probably the most surprise a novel has taken me by since...well, maybe ever...The thousands of people crowded around me on the subway disappeared and I almost sailed straight past my stop (and not for the first time). 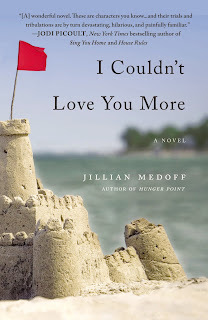 A mother's love and a modern family are central in I Couldn't Love You More and portrayed with unflinching honesty including all the messiness, imperfection and unyielding love they encompass. The emotions are real, believable and heart wrenching and I felt every one of them. I laughed and cried along with Eliot, her daughters, her sisters and her mother and I loved watching her relationships with all of these women grow and evolve and I equally loved all their characters. There are so many themes in this novel surrounding family that I can't even begin to explain or explore, nor do I want to spoil. I'll stop gushing now so you can go buy the book. There are quick links above so you can start reading Medoff's words now! Take this one to the beach this summer. You won't be disappointed. Thank you to Hatchette for our review copy! Oh My God! This is the most wonderful review (full disclosure: I sometimes read the amazon and goodreads reviews and some of them are so snarky they make me gasp). Thank you so much for your support. I'm just so flattered and grateful.